The PhantoMount Action Cam gimbal features a 2:1 belt drive reduction and double ball bearings on the roll axis for smoother travel and video quality. A direct servo drive on the tilt axis reduces the forward weight, and simplifies the overall operation of the gimbal. Purchase the carbon fiber F450/550 Flamewheel Legs and raise your F550 3.25" off the ground allowing 1.5" of clearance between the bottom of this gimbal and ground. Utilizing the Gimbal Stabilization built into the DJI NAZA-M or Wookong-M flight controller you can directly power and control the gimbal. No additional expensive stabilization controller is needed. The PhantoMounts Action Cam gimbal will arrive fully assembled and tested. 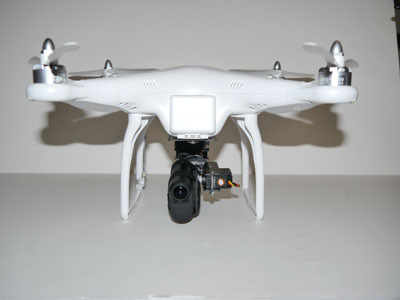 Installation onto your DJI Phantom is easy too. Connect to your flight controller, set up and tune the gimbal in the DJI Assistant Software then film where you fly! We recommend that you power your PhantoMount Action Cam gimbal servos through a 6v BEC harness. This will provide smoother reaction and cleaner videos. The PhantoMount Action Cam gimbal is intended for aerial photography with the camera out of its case. For FPV flight, removal of the ports cover is required to access the HDMI output. This gimbal is also top plate convertible to fit multiple airframes with the PhantoMounts Top Plate Conversion Kits.